The Metropolitan Police confirmed officers were called at 4.45pm this afternoon to reports of a burglary. Whilst en-route to the scene, they were approached by a member of the public, reporting a man acting suspiciously and armed with a screwdriver in Lawrence Gardens, Mill Hill. When the two officers tried to speak with the man, they were assaulted by the suspect. One officer suffered head injuries, whist the other sustained injuries to his arm. Both were taken to by ambulance to a hospital in north London for further treatment. 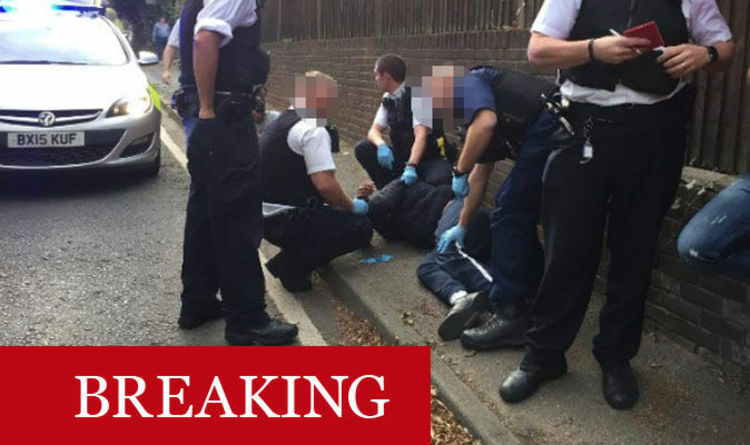 Following the assault, the3 29-year-old suspect was arrested on suspicion of attempted murder and taken to a north London police station, where he remains in custody. This happened just 24 hours after a man was stabbed in Wood Green, north London. He suffered serious injuries, although Scotland Yard confirmed they are not life-threatening. Last week, the Office of National Statistics (ONS) released its latest knife crime figures. They showed violent crime levels at their highest levels in England and Wales since records began, as knife offences continue to soar and the number of solved cases falls. The ONS said police recorded 39,332 knife offences in the year to June 2018 – the highest number on record. This was an increase of 12 percent from the previous 12-month period. Knife crime was worse in the capital, with almost 15,000 offences committed during the past year. The ONS data includes 91 knife murders, 170 rapes or sexual assaults carried out with a blade and 8363 knife-point muggings.